To the people who had their hearts struck by the best-selling novelist and poet Lang Leav, this is your chance to meet her in person! 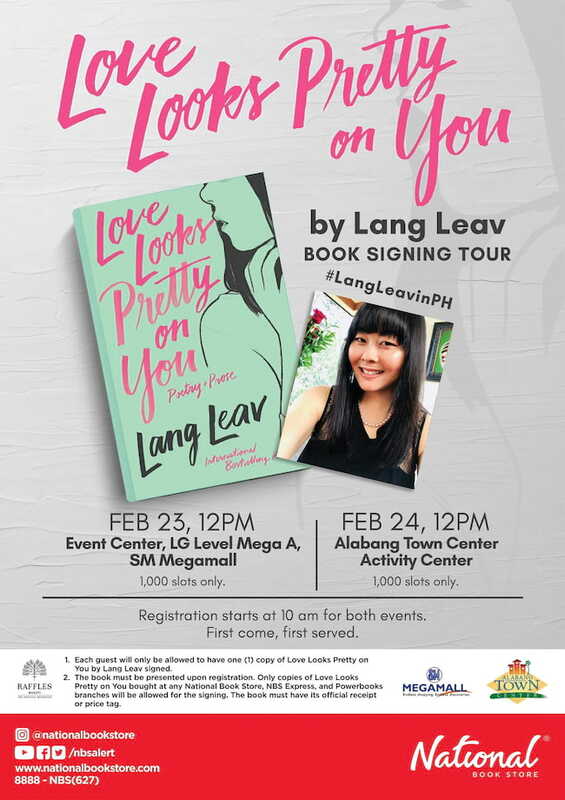 Now on her third time here in the Philippines, Lang Leav will be coming back to Manila this love month on February 23 and 24 for her Love Looks Pretty on You book signing tour. Hosted by National Book Store, the book signing event will be held at the Event Center of SM Megamall on February 23 and at the Activity Center of Alabang Town Center on February 24. Be sure to grab a copy and arrive early because only 1,000 participants will be accommodated per venue when the registration starts at 10AM. You may pre-order a copy now at the National Book Store website. For more information about the event, visit the National Book Store Facebook, Instagram, and Twitter pages. Homestream image from National Book Store Facebook page.